Thin airfoil theory gives $C = C_o + 2\pi\alpha$, where $C_o$ is the lift coefficient at $\alpha = 0$. However, I couldn't find any equation to calculate what $C_o$ is which must be some function of the airfoil shape. 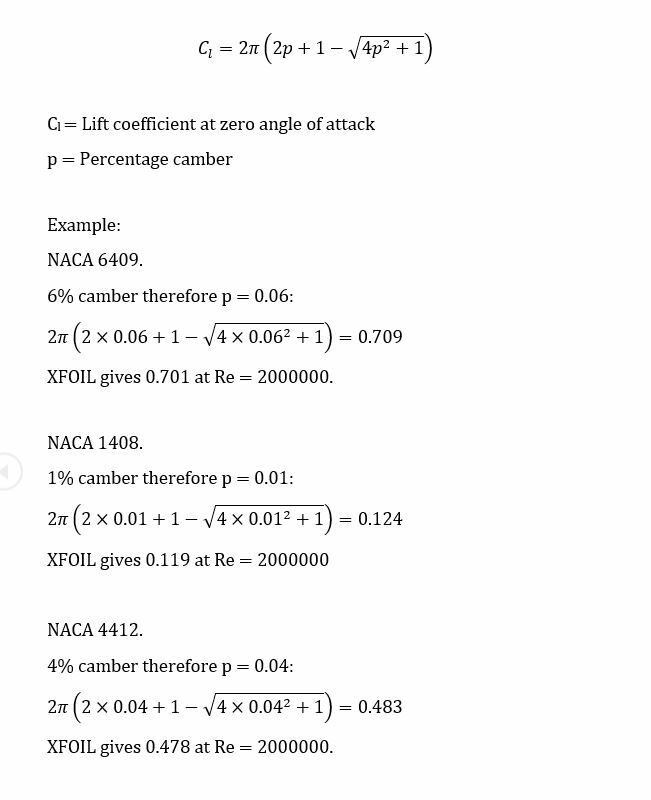 In other words how do you extend thin airfoil theory to cambered airfoils without having to use experimental data? This is my own attempt, I made this airfoil model of the lift coefficient of the airfoil at zero angle of attack for a project I am working on. It's derived from a Joukowsky transform. it seems to work but how is $C_o$ actually calculated? Because it is derived from the Joukowsky transform of the inviscid potential flow around a cylinder it's more accurate at high Reynolds numbers. Browse other questions tagged aircraft-design aerodynamics lift fluid-mechanics or ask your own question. Does zero-lift angle of attack depend on Reynolds number?